Good morning, my lovelies! I've been away from the blog for a couple of weeks, busy with a trip to Chicago to visit with my sister and nephew, a couple of interior design projects for clients, and keeping up with the reading for a class I'm taking. But last night I finished my quilt guild name tag, and I can't wait to share it with you. I even put together a little tutorial in case you'd like to make a magnetic name tag of your own. To recap, I finally joined my local quilt guild recently and needed a handmade fabric name tag to wear at meetings and workshops. 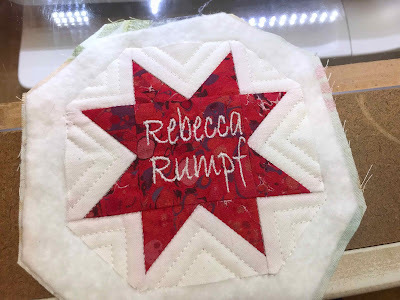 Since I have so many projects already in progress (and so little time to work on any of them), I rummaged around in my studio and came up with an orphan sawtooth star block to use rather than starting from scratch. 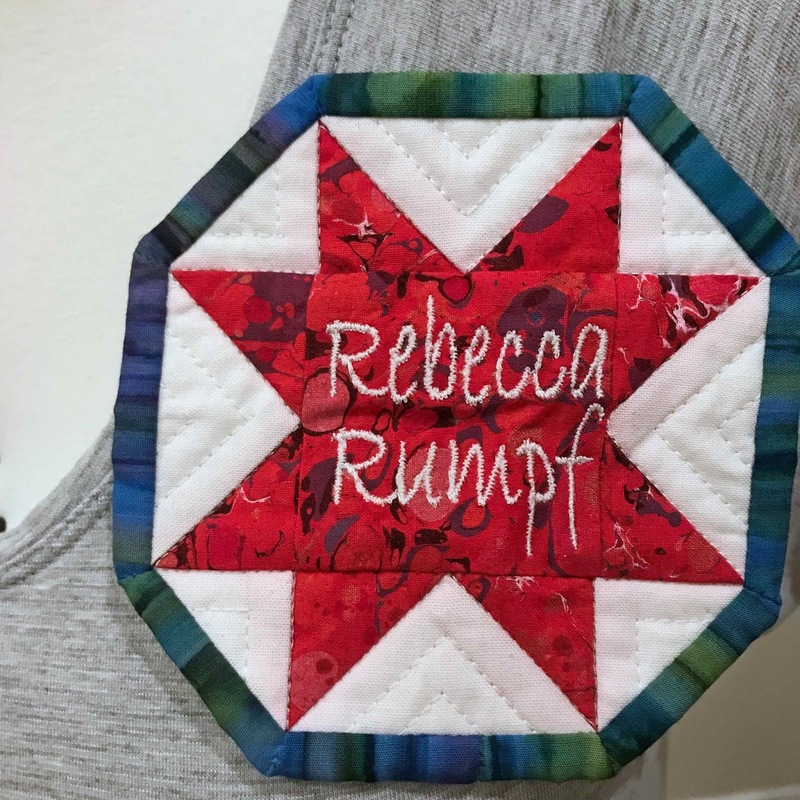 I machine embroidered my name as legibly as possible -- not sure whether the last name was necessary, but put it on there to be safe so I wouldn't need to make another one -- and did some basic SID and walking foot quilting around the star. Blech! See what I mean? My eye just goes right to that awful double black stripe on the right side of the name tag. 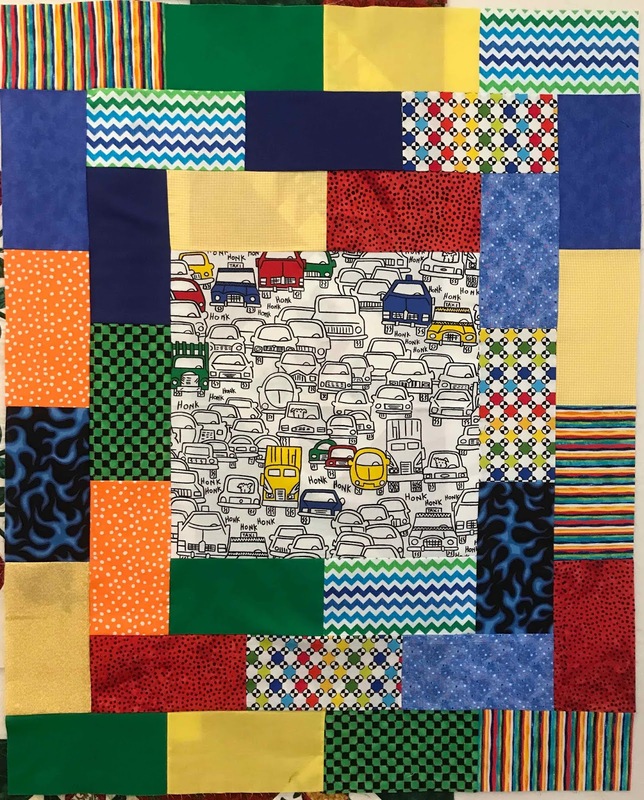 The other thing is that, on a regular size quilt, the proportion of binding fabric to main body of the quilt is much smaller. I felt like, on a small piece like this name tag, the striped binding was distracting and overwhelming, not the subtle pop I was looking for. 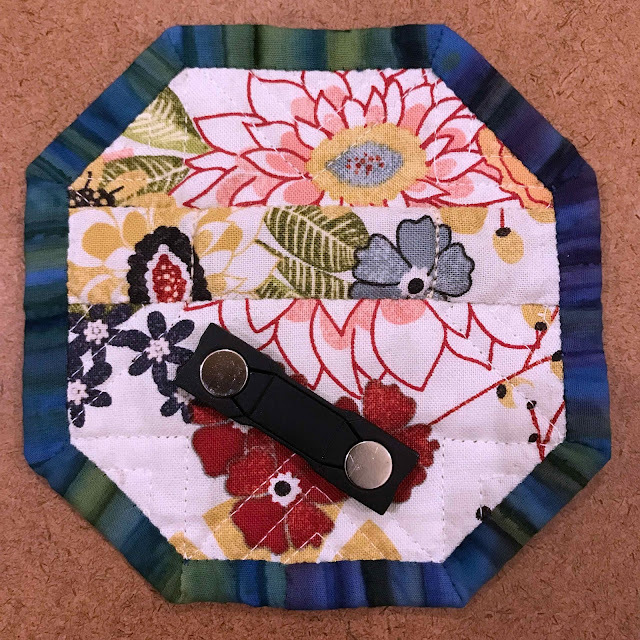 I put the project in Time Out for a few days to see if the binding would grow on me and whether I could get over the awkward join, but in the end I had to rip off the binding and do it over. None of this is terribly exciting. 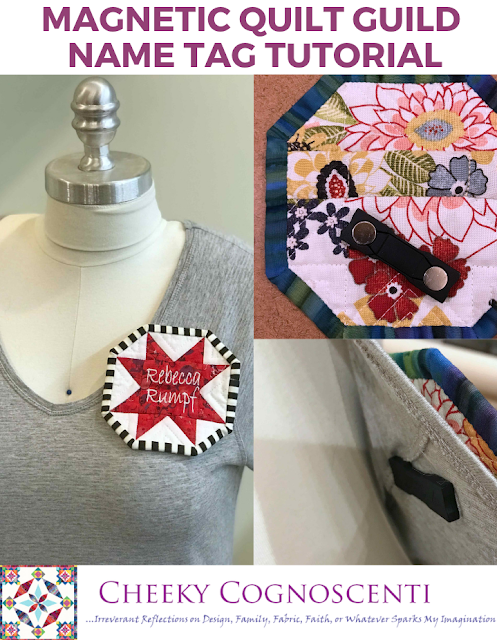 What I AM excited about is that my name tag doesn't hang on strings around my neck or attach with pins that might snag my favorite sweater or blouse -- it's MAGNETIC! The neodymium magnets are super strong and will even hold the name tag securely through a thick sweater; I tested it to be sure. Here's how I did this. The magnet bars aren't expensive -- at the time of this post, you can get a 10-pack for $7.99 with Prime shipping. You can make yourself a different name tag for every season, or make some as gifts for your friends. As you see above, the magnetic hardware consists of two pieces. There's a thin metal rectangle with smooth corners that has 3M adhesive foam on one side, and there's a thin rectangle plastic piece with smooth corners that has the two magnets attached. They do sell versions with three magnets instead of two, but my experience is that two magnets is plenty strong enough to get the job done. 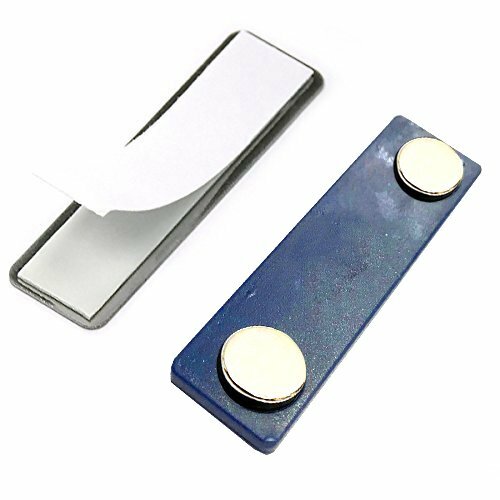 The metal bar is the part that gets permanently attached to the back side of your name tag, and the plastic bar with magnets attached is the piece that you snap in place on the underside of your clothing. That 3M adhesive tape on the back of the metal bar is what you would use to adhere the metal bar to the back of a plastic or aluminum name tag, but I sliced it right off with an Exacto knife since I'm going to sew the metal bar into the back of my fabric name tag. A razor blade would work, too. You don't have to be fanatical about removing all of the foam, either, as long as you get rid of most of the bulk and all of the sticky glue. 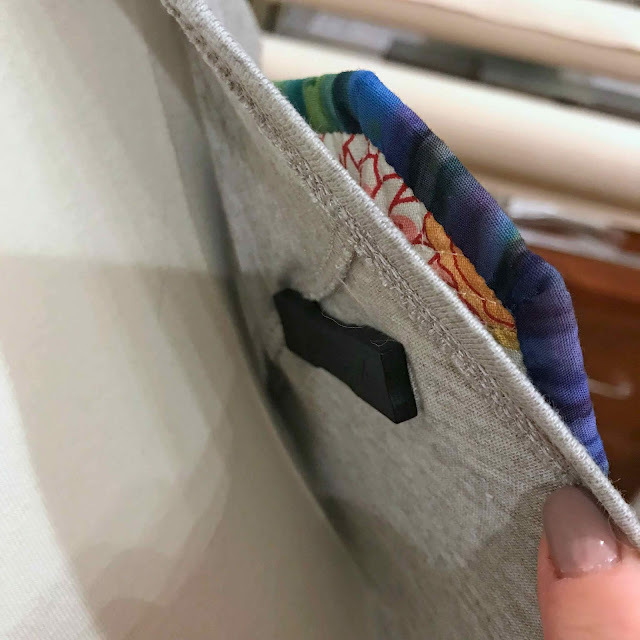 I attached the metal bar to the back of the name tag with a tiny little sleeve, made the way you would make a hanging sleeve for a quilt show. I cut a rectangle out of my name tag backing fabric, folded it in half WST, and sewed along the two long raw edges. Then I centered that seam and pressed the little tube flat with my iron. 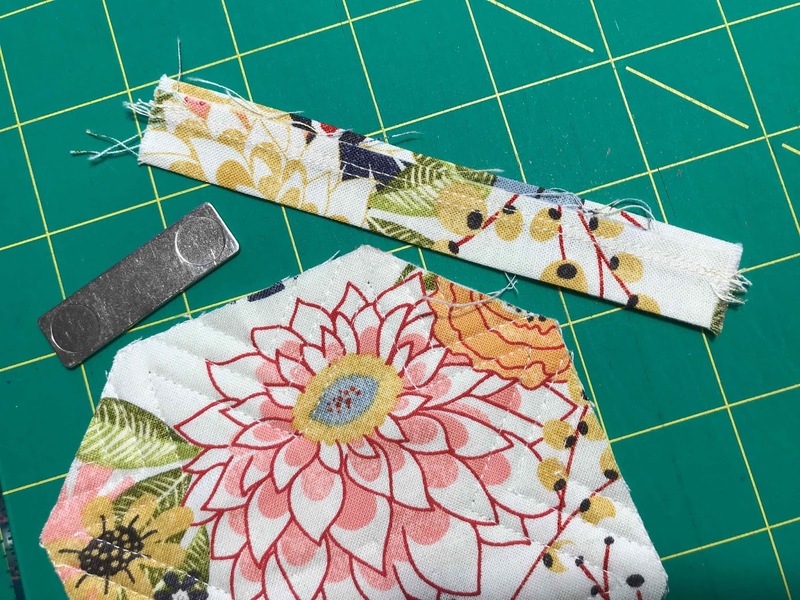 I didn't measure this piece, just eyeballed it so it would finish close to the width of the metal bar, but with enough loose fabric at the edges for me to hand stitch it to the back of my name tag. I knew I wanted to position that metal bar about a third of the way down from the top of my name tag -- high enough that it didn't flop down when I was wearing it, but with that metal bar far away from where I would be machine stitching the binding. 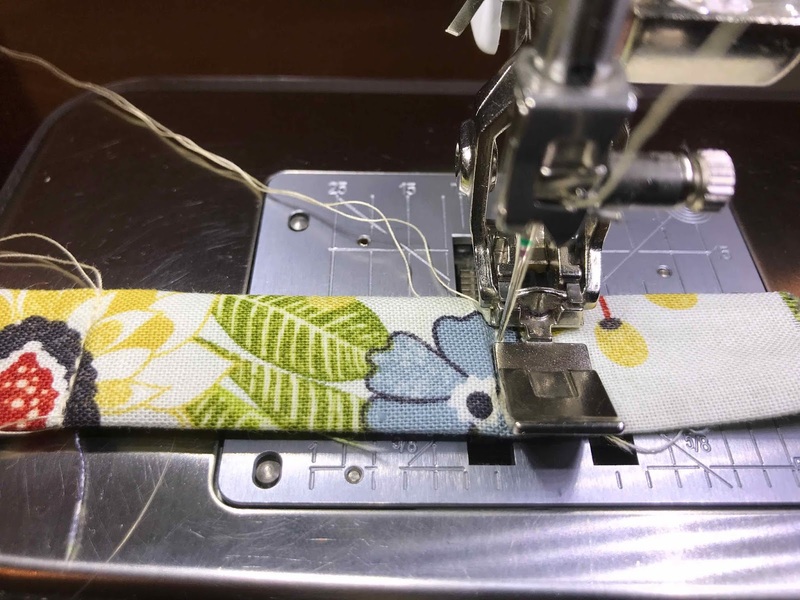 But I didn't want the metal bar to slide around inside the fabric casing, so I used my zipper foot to sew a triple straight stitch right up against both short ends of the magnet, trapping it in the center of the tube. Next, I positioned this little fabric tube horizontally across the back side of my name tag, trimmed the raw edges of the sleeve even with the edges of the name tag, and secured the short edges with machine stitching about 3/8" in from the raw edges, so the machine stitching would be concealed by my binding. At this point, you could go ahead and stitch the long edges of the fabric tube down to the backing fabric by hand, but I chose to attach my binding to the front of my name tag first and then secure the long sides of my sleeve when I was hand stitching my binding to the back side of the name tag. Easy-peasy, but oh-so-snazzy! Now I have a name tag for the November guild meeting, which is tomorrow evening. I haven't decided whether I need to jazz my name tag up with any embellishments or if I prefer it plain and simple, the way it is, but at least it's done! 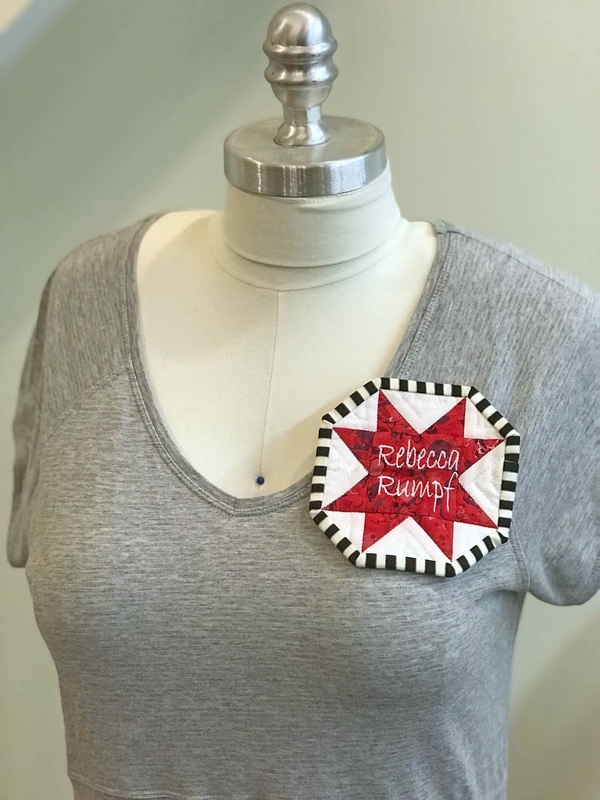 I mean, I could still add some beads, or sequins, or French knots, or additional "big stitch" quilting by hand in a decorative thread... Heck, I could wire it up with a battery pack and blinking lights if I REALLY wanted to draw attention to myself (not!). What's next on my sewing agenda? 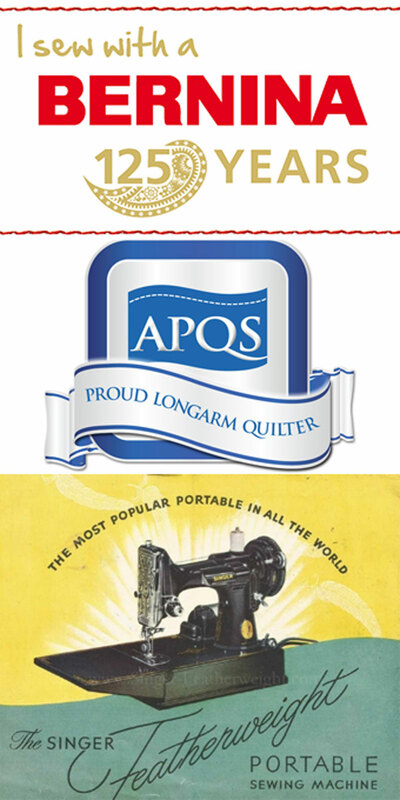 Well, I still need to load up that outreach cuddle quilt on my longarm machine and get it quilted. I'm running out the door for an appointment in a few minutes, but hopefully I'll get to that this evening. Anyway, that's my To-Do for Tuesday weekly goal. This Outreach Quilt Top is STILL Not Loaded for Quilting! Great name tag creation! I have that magnetic backing, and it's fantastic! No holes in my shirts! Fantastic name tag!! 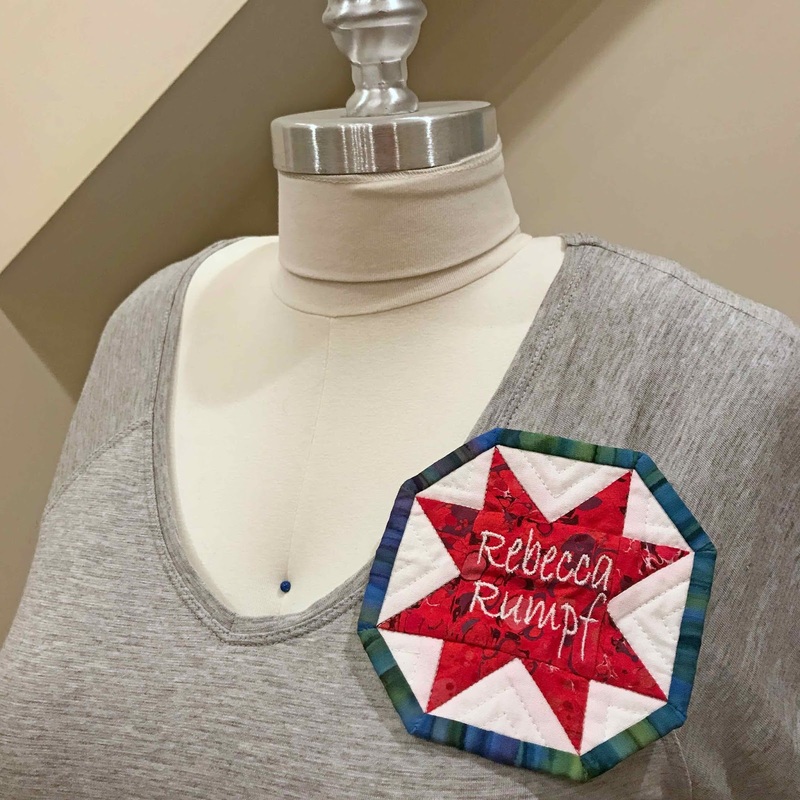 My guild decided they didn't want to sew fabric name tags so they are purchasing printed ones. Yeah, not as nice since we're a quilting group. I wish I'd known about those magnetics before as people said they didn't want things hanging around their necks or pins that pop holes in clothing. Great tips and post!! I really enjoyed this post! Magnetic name tags are a revelation to me! My littlest one needs a name tag for Brownies so the discovery was very timely. I love how your tag turned out, although I liked the stripey binding too. I have a bit of a thing for stripey binding, it has to be said. Thanks for sharing! How creative and pretty, the name tags. The Outreach quilt is looking great as well. Kudos for a great post. I've got a "hang around the neck" tag and I'm going to take it apart -- more likely start over -- and fix it so I can do it by magnet. Thanks for the directions. Happy thanksgiving are you having pineapple? 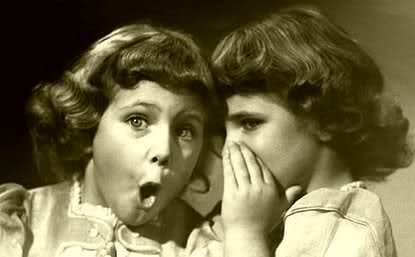 Cheeky Cognoscenti is a participant in the Amazon Services LLC Associates Program, an affiliate advertising program designed to provide a means for sites to earn advertising fees by advertising and linking to Amazon.com. Like What You've Read? Follow by Email and Never Miss a Cheeky Post! How High is My Cutting Table? And How Big is TOO Big? Tetelestai: It Is Finished! My Pettiskirt UFO is No Longer Unfinished! Wahoo! Mission Impossible: All 48 Blocks WILL Be Completed Today! What Height My Sewing Table? Ergonomics, Schmergonics! I might receive a commission for purchases you make through some of the links on this blog. This does NOT have any impact on my recommendations, but it does help to defray the cost of my wicked fabric shopping addiction. I only write about products that I personally use and love, and I promise to let you know up front if ever I'm given a freebie in exchange for writing a review. Never Miss a Cheeky Post! Follow This Blog by Email!